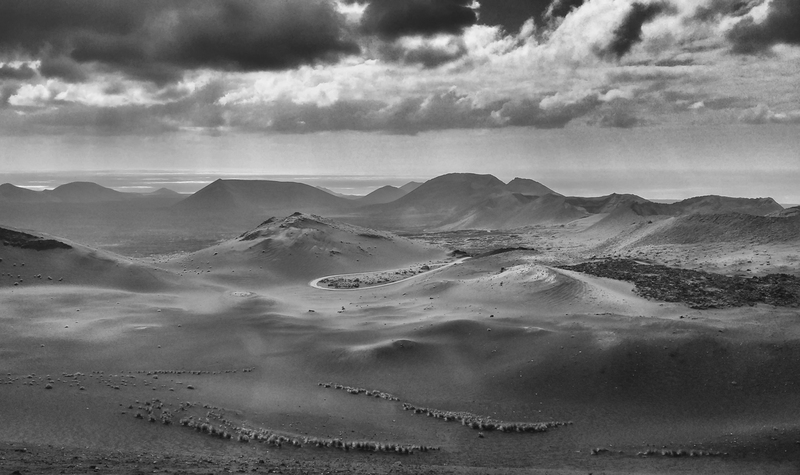 Two sunburnt islands where wind and volcanoes have carved out surreal and alien landscapes. The former somewhat wild, the latter more suited to tourists. Chapter I: Can’t find your way around? No chance! On March 19, Nina and I leave from Rome for our journey to Lanzarote, an island named after the Italian navigator Lanzarotto Malocello. Right outside the airport, a great single-cylinder BMW F650GS is waiting for us. It has been delivered by Blue Speed. We quickly go through all the practicalities then we load up our motorcycle and we hit the road heading for Yaiza. 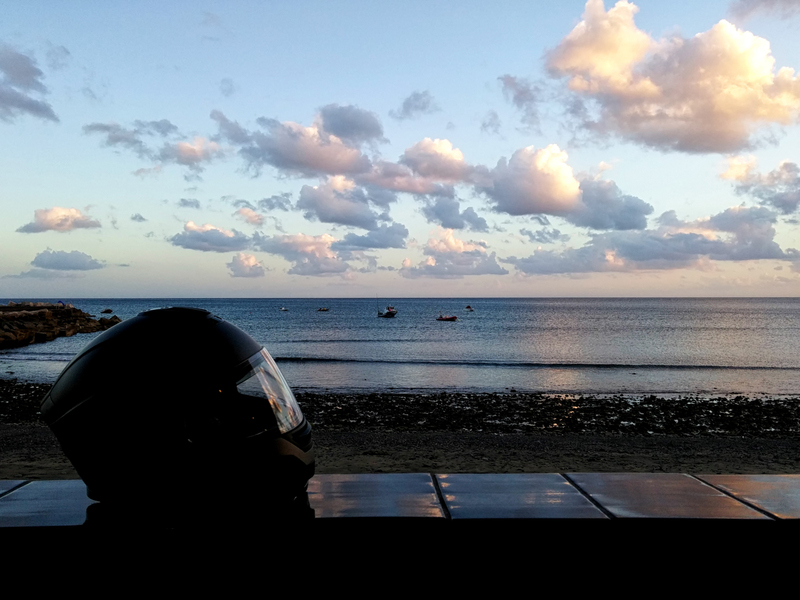 Lanzarote greets us with a sunset of indescribable colours and unfortunately, the fading light does not allow us to see much more, but one thing does catch our eye: the roads, which are paved as well as those around Mugello! Perhaps they are surfaced by the same company. The asphalt is perfect! With no maps, no GPS, and no wrong turns, we arrive at the B&B we have booked in Yaiza and the journey only took us 10 minutes! Ok, I get it, on this island you cannot get lost, even if you want to! The next day we decide to visit the south of the island and from Yaiza we travel through the wine region of La Geria. Once there, we experience first-hand how the human hand can produce such great wine! Back towards the south, we follow the lava path to the ocean. 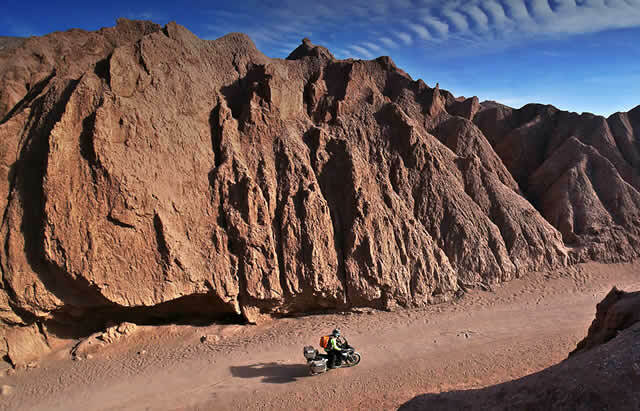 We continue riding to El Golfo. Then we reach Los Hervideros, a large parking lot full of people. We get off the motorbike and follow a path which is above the parking area and there we stand astonished! 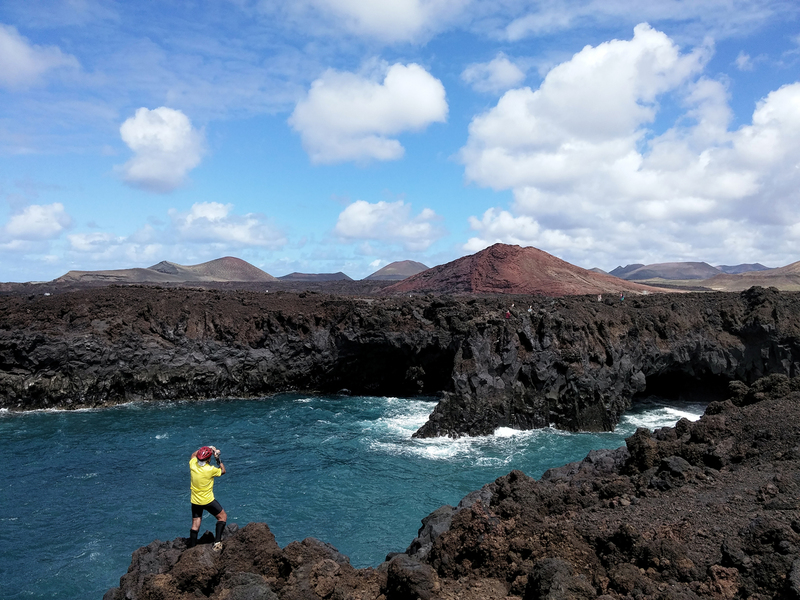 Lanzarote reveals itself in all its beauty: the sky so blue, those volcanoes so red, the black of the rocks and of course, the ocean, deepest blue. The view does indeed take our breath away! We ride along the coast for a few kilometres, then turn towards Playa Blanca which is the departure point for the ferry to Fuerteventura! 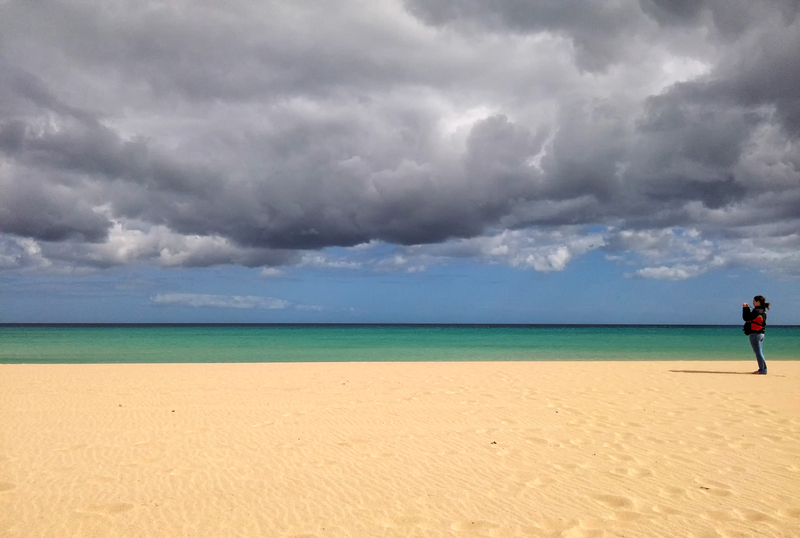 Once in Fuerteventura, we disembark and cast a glance at the map. There are two roads we can take; one is along the coastline, the other looks like a short cut. Needless to say, we go for the short cut! The asphalt is no different from that found on the other island. After a few kilometres of easy riding we come across the small town of La Oliva, location of Casa del los Coroneles, a 17th century construction built in the typical style of the island and which was the seat of power during the era. We continue our descent on the back of our faithful ‘steed’ and we reach Tiscamanita which will be our travel base during the coming days. The next morning we continue to ride south and along the road I see a dirt path. With no time to think twice, I’m on it! The incline increases and the surface gradually changes. Nina, who is always conscious of how steep it might become, gets off and leaves me to ride ahead. The rubble is becoming bigger and bigger, the back of the motorbike is moving from side to side, while the front is throwing up stones against the skid plate. I put my foot down until I reach the top. The surface is compact, so I relax and enjoy the landscape characterized by white beaches and surfers, which are ever-present on this island. Awe-inspiring! This side of the island is the most touristy and indistinctive with terraced buildings, palm-lined avenues and high street stores. We leave the city and in the rear view mirrors I can still see the huge cruise ships moored in the harbour. Ahead of me, there is nothing and almost immediately the road is unpaved. The wind begins to blow more forcefully, but we do not give up! Regardless of the roads being unpaved, there is still a fair amount of traffic, probably all hired as 90% of cars on the island are rented! What a great business! After following 17km of dirt road, fortunately paved better than many roads back home, we reach the extreme south of the island, here, under the lighthouse, we sit and enjoy the sun reflecting on the surface of the ocean. We start again and it is already late afternoon. The return is exhausting as for every single inch of road the strong wind jerks the bike to the right and left, I try to curl up a little, but it does not have much of an effect as Aeolus is far too strong. The following morning, I wake up to the same strong wind that wore me out the day before. Damn! This time we want to visit the interior of the island and the other side of the coast, so we begin from Aguas Verdes. 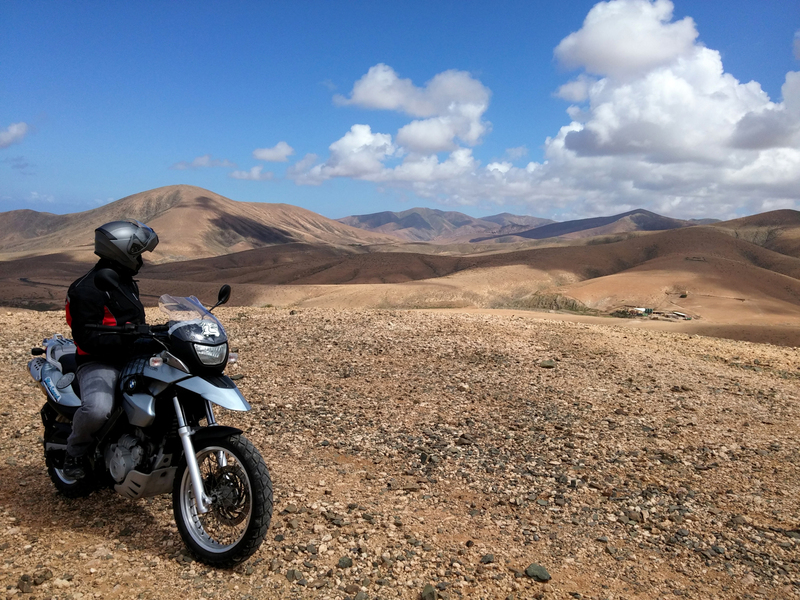 We continue riding to the middle of the island where the road runs along the highest peaks of Fuerteventura. From the Mirador Velosa viewpoint I take a panoramic picture of the whole island! Unfortunately, I do not get to enjoy the landscape for long as the wind is so strong that it is hard to stand up! The route is filled with many scenic spots where the squirrels beg for crumbs from the tourists, while the hawks survey everything from above. Suddenly, the squirrels vanish and the hawks are vanquished; a black shadow is cast on the ground. The lord of these heights has arrived, intelligent, strong and pitch-black: the raven. It lands a few metres from us, it seems not to be interested in the humans in the vicinity, after all we are the guests and he is the master. 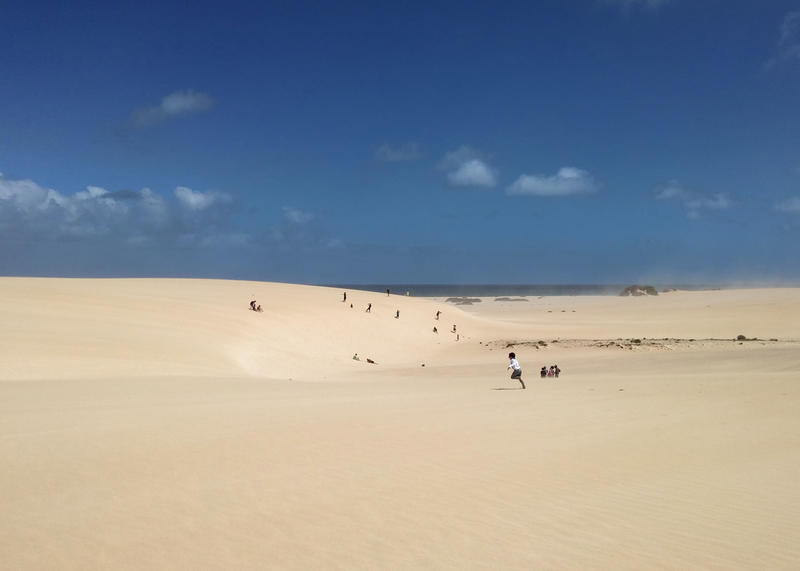 Our last day in Fuerteventura. Like any finale there must be a clash with the enemy and he knows this. In fact, today the wind is terrible! We jump on the bike, take one last look around and say goodbye to this part of the island. We decide to take the coastal road to return to the port. Along the way the wind is against us, strong and constant. I try to lean forward to ride as upright as possible and in response, the wind slaps my helmet and kicks the bike! I cannot ride in a straight line, twisting from left to right, but I hold on, as I need to reach the ferry and leave this island. 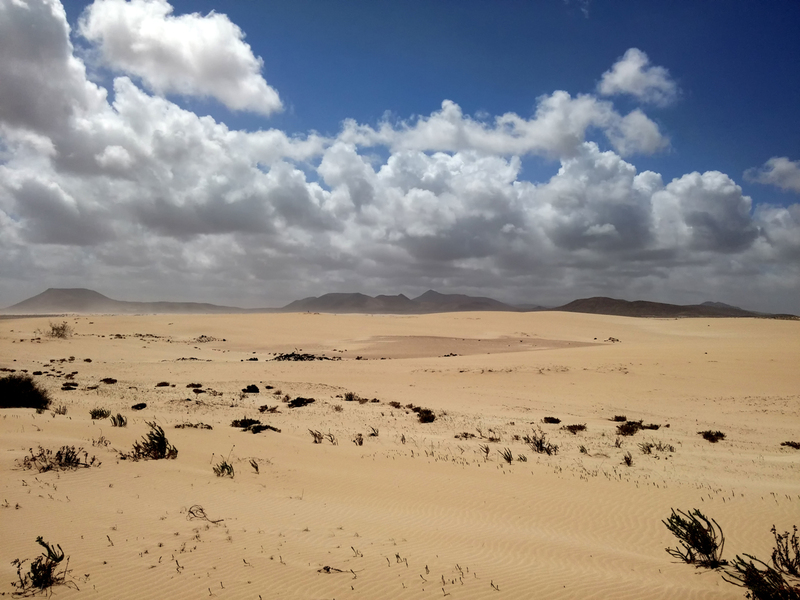 When we are almost at Corralejo I start thinking I have made it, I am obviously that naïve as I feel like Ulysses fighting to return to Ithaca. Finally, the city is in view! I dash to the harbour and arrive just in time to see the ferry departing. Damn you wind, you won the battle! According to our schedule, we arrive in Lanzarote two hours late and again the wind is here, welcoming us, but it is less strong, far less relentless and less aggressive because this is not its island, here it is a guest just like us. On the way we stop to pay tribute to the true owner of Lanzarote: Hephaestus who, three hundred years ago, covered a third of the island with lava and ashes, giving it its unique appearance. For now we merely acknowledge Hephaestus but we will meet him again later, on our way to Tabayesco, in the wild north, where our next base awaits us. Before arriving at the village there is the famous Malpaso, a series of curves and bends that meander along a gorge and then flow into the sea. It seems a Dantean descent into the underworld. After the tortuous journey we arrive at our destination and I cannot wait for tomorrow. We ride along the border of the national park and enter a path whose surface is made up of coarse volcanic lapilli that is anything but compacted. The bike dips, dances, pitches … it looks like a ship at the mercy of the waves! 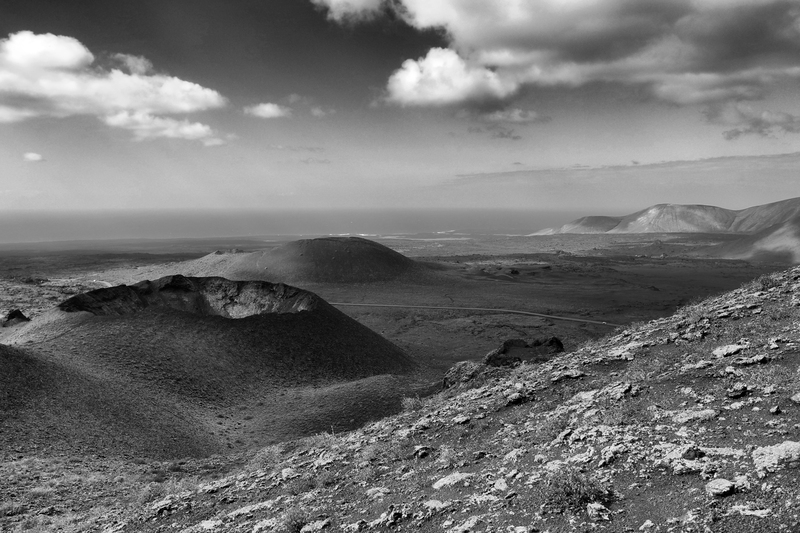 We are on solidified lava between the ocean and the volcanoes; only in Lanzarote is such a thing possible. Suddenly, the road improves, the surface is compact and I have a sense of deja-vu. I take an easy ride and arrive at an intersection; on the right there is a strip of asphalt and on the left the road heads towards the ocean. What would you do? 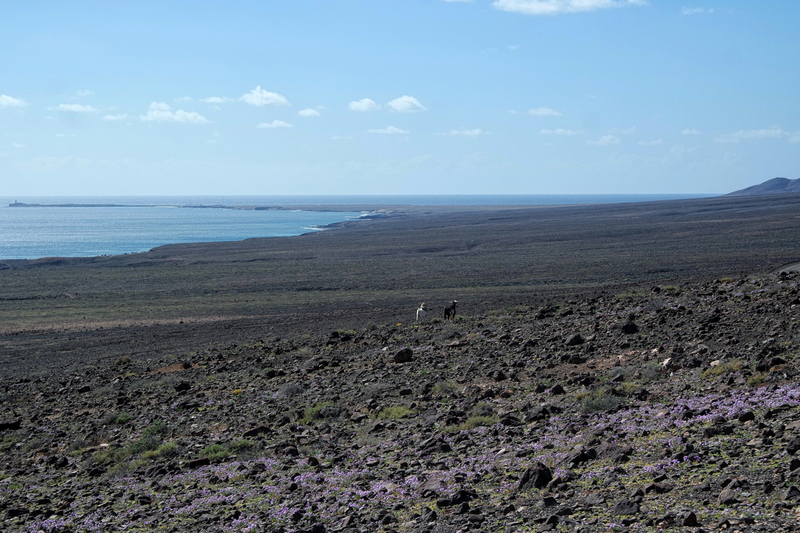 After a few kilometres we find ourselves in an isolated, deserted location where the ocean tries to carve out the black volcanic rock, in other words, Playas de las Malvas. It is impossible to elaborate as that would be useless. This is a place that needs to be experienced first-hand. 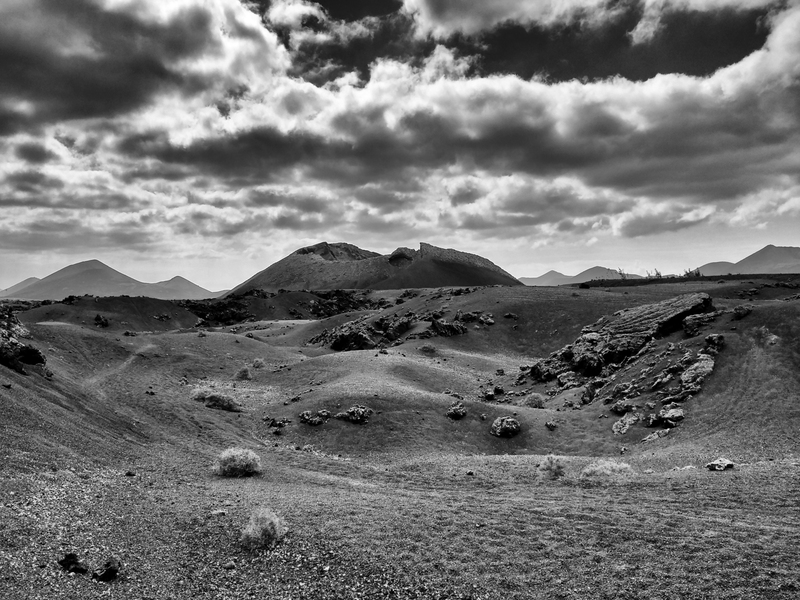 In the afternoon we go to “god’s” house at the Timanfaya National Park, where the last eruption began. The park is off-limits, so we pay the entrance fee. We park the motorbike under a restaurant built on the mouth of a volcano that uses the heat of the earth to cook. We board the bus for the visit and Hephaestus shows his muscles and makes it clear how his simple gesture can bring enormous destruction. Unfortunately, we are not permitted to enter the volcano. 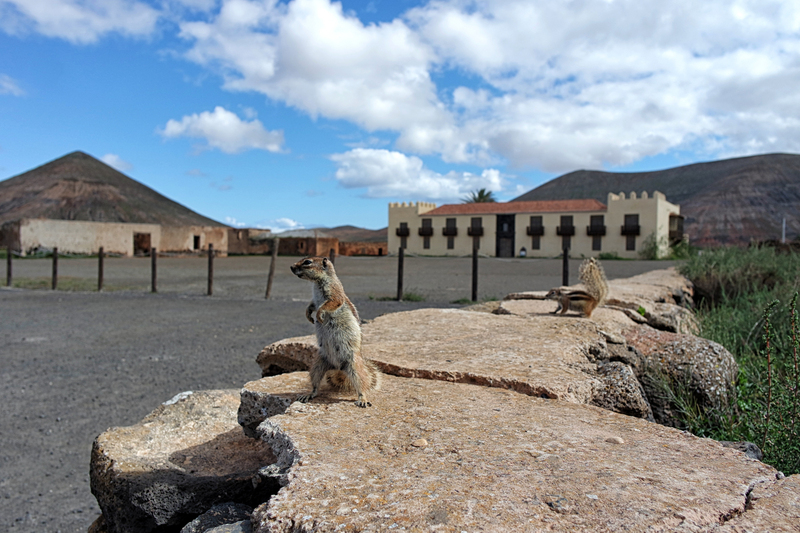 There is audio playing which explains, in various languages, the history of Lanzarote and its volcanoes. The view from the window is absurd, surreal, alien, just as I would imagine Mars or the Moon to be. It also looks like there could be no oxygen outside the bus. What is clear is that there is no life and who knows how long you would need to wait before seeing any signs of life. With this marvel still in our eyes we return to the B & B. Today was a spectacular day! After a breakfast consisting of cactus jam, our expedition continues and this time we head north to the greenest and most luxuriant part of the island. However, this time, what is above is of no interest to us, but what is hidden beneath is our true focus. We enter the veins and arteries of this living pulsating landscape. We penetrate the circulatory system of Hephaestus entering the Cueva del los Verdes, a cave created by the path of the lava in the subsoil. Inside the earth the colours change, but there is less heat. In fact, in the darkness, interrupted by coloured rock veins, the temperature is consistently over 20°. The guide explains that in addition to destruction, the lava also brought life, because in these caves people found refuge when they were under attack by pirates. A truly impressive visit! On the road we find the Jardin de Cactus, a kind of botanical garden with more than 1400 succulents, some being a few metres tall. 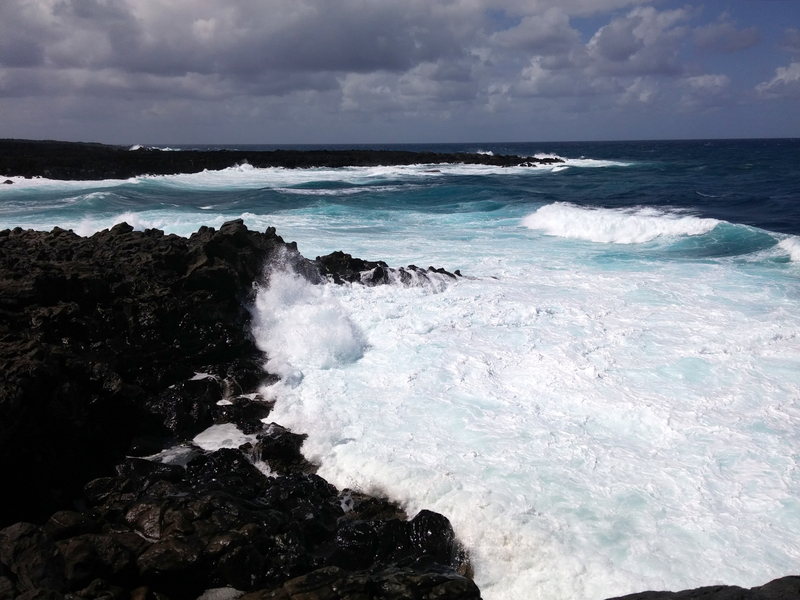 This place, like others on the island, were created by César Manrique, an architect, ecologist and artist born in Lanzarote. Driven by love for his island, he tried to improve its value without ever distorting or exploiting it. Manrique created all the sculptures, transient or permanent, which are on the island, the Restaurant of the Devil on Timanfaya, the aforementioned Jardin de Cactus, in short, if Lanzarote is this wonderful, it is largely thanks to César Manrique and that is definitely worth mentioning! La Montaña del Cuervo shows another side of the eruption, the explosive one, in fact the mountain itself bears the signs of the explosion. Thank you Hephaestos for guiding me to this place! This volcano, unlike the others, can be reached by motorbike and can be visited on foot. In fact we walk around and then get inside. The black earth sparkles with the minerals set in the rock, like precious stones in jewellery. The mountain also has a second surprise for us, from the top it gives us a unique view of the Timanfaya, the volcanoes and the lava flow. The next day we are due to leave. 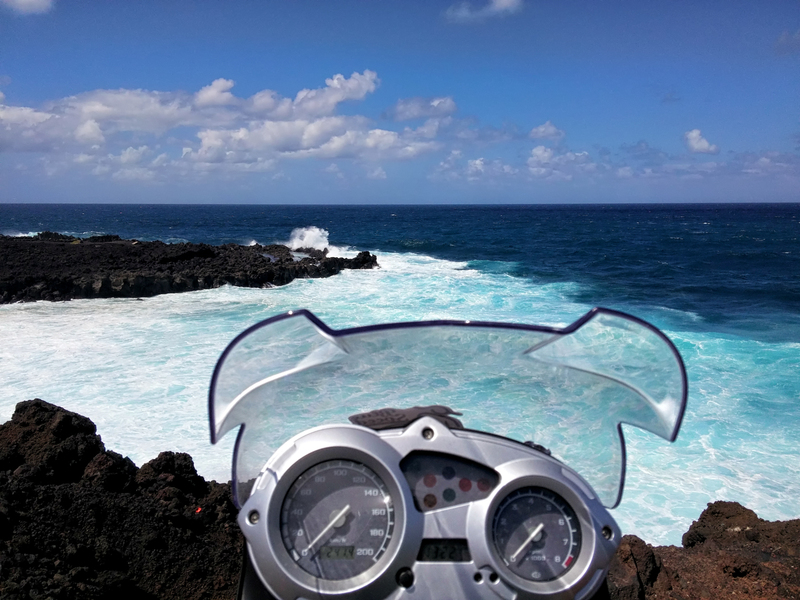 We load the bike and take a quick tour of the few places that we have not yet visited; in the northern area we only need a lookout overlooking the island of Graciosa. It’s time to go, heading towards Arrecife we think of everything we’ve seen, the inhospitable terrain of these lands and the marvel of their uniqueness. We browse memories like one would turn the pages of a book, this journey has put us in touch with the four elements, with nature, showing us landscapes that seem to come from another planet. Like all journeys, this one has come to an end, but this is a good thing because it inspires us to start a new one. Who knows next time what sights our enthusiastic eyes will behold?